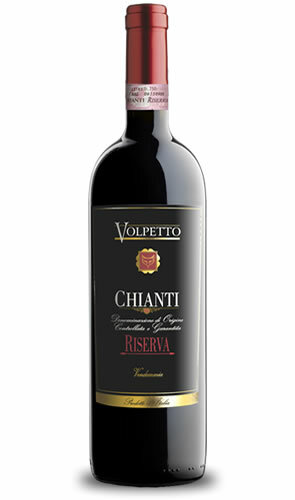 Volpetto Chianti Riserva Italian wine. L&P Global. Hand selection of the best Sangiovese grapes. 100 % Sangiovese. The grapes are destemmed and gently crushed. Fermentation takes place in stainless steel tanks at a controlled temperature of 22°C with macro oxygenation that lasts for 12 days. The juice is left in contact with the skins for 8-10days. The wine is aged then for 12 months in Slavonian oak barrels. It has a highly concentrated bouquet. Well-structured and full-bodied, the tannins are well integrated giving a smooth, yet complex wine with a deep intensity of fruit and powerful, long finish. To be served with red meats, roasts, pasta with meat sauce and cheese.